Double Life manifests as a large-scale site-specific window installation covering all 60-window panes in Alumni Hall. 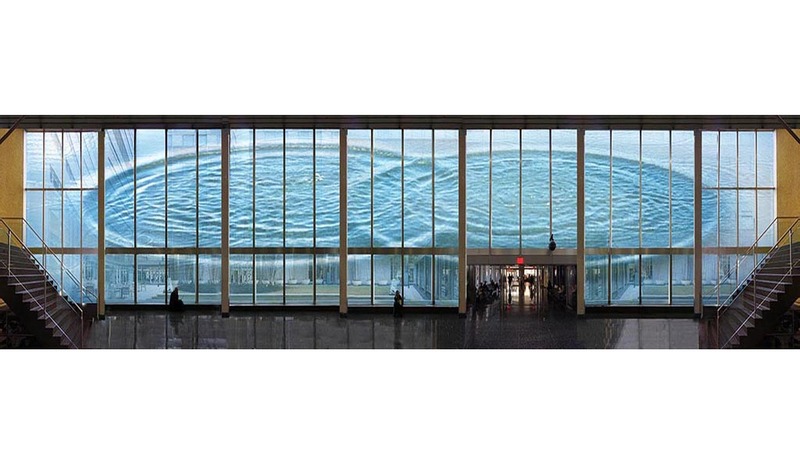 Consisting of both translucent and transparent adhesive film panels that together portray the intersection of two rippling water circles, the image induces a sense of calm to passersby. The formal qualities of the image evoke associations with the infinity symbol, cell division/reproduction, and the concept of vesica piscis, an ancient symbol of creation. 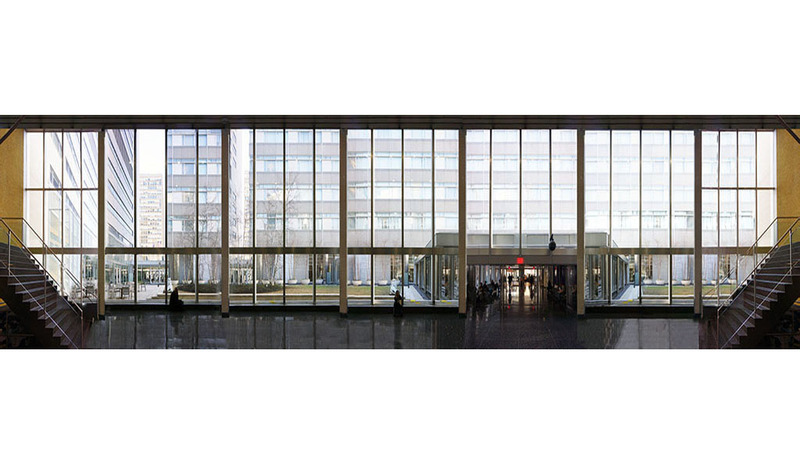 The image is activated by the already existing logic of the medical center’s architectural design—natural light illuminates the image from the courtyard during the daytime and artificial light from Alumni Hall at nighttime. 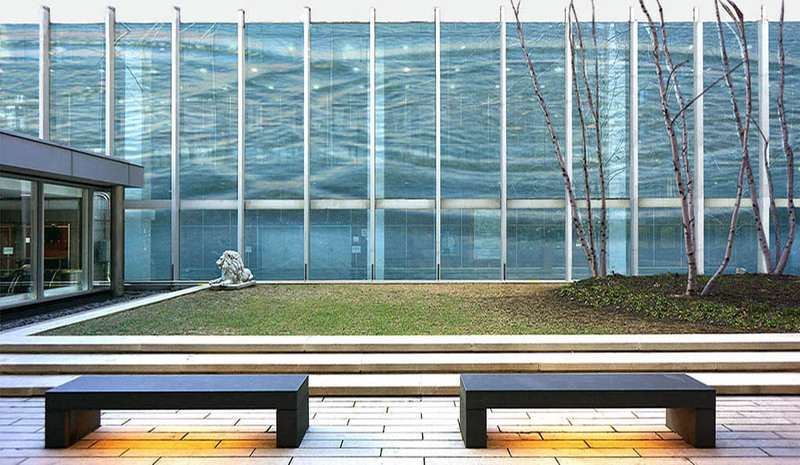 As such, viewing Double Life from the many vantage points offered by the inner space of Alumni Hall and the outer space of the courtyard, will provide a variety of visual experiences and reflect the manifold healing processes available at NYU Langone. Overall, Double Life reshapes its surrounding environment into a place for rest, meditation, and rejuvenation, offering patients, and particularly staff and doctors, a space for self-care. Chance, Life and Infinity are the keywords that resonate with this work. In this image I identify the beginning of a propagation process originating an organic image of life, as if a single cell had separated into two equally balanced ones. This image resembles the symbol of infinity instantaneously immersed in the water of an endlessly visible here and now. The image was created by chance and choice in an intentional and random process at once: my child was throwing little stones into a pond while I was photographing the rims that ruffled the still surface of the water. The pace of this mutual process eventually turned into a ritual: each throw provoked unpredictable visual results while my shooting was taking place in moments when I could suspend the command of my will. A physical phenomenon and chance had found their plane of mutual correspondence on that water surface, as if the child’s hand and mine had become one: only once and never again did the throws and the shots originate two symmetrical rims. 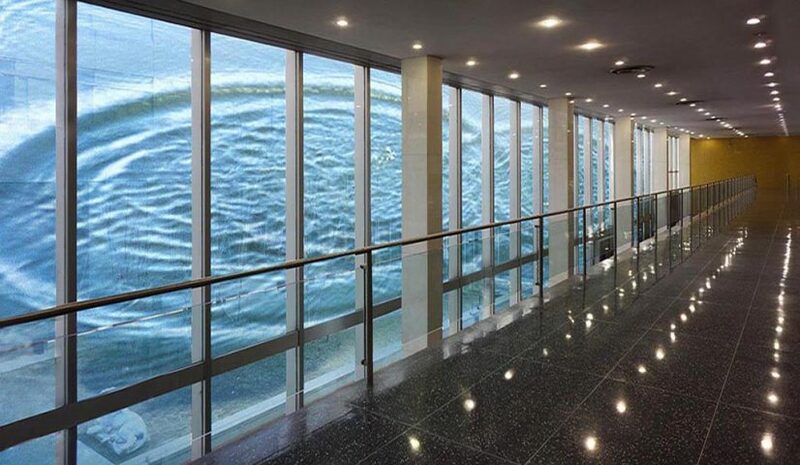 Visiting the Langone Medical Center I was struck by the glass wall of the Alumni Hall: I saw it as a majestic threshold connecting and separating the inside and outside of the building; an architectural feature with an extraordinary potential to offer a visual and existential value to the environment it is immersed in: a vehicle for light and imagery, a symbol and metaphor for life. 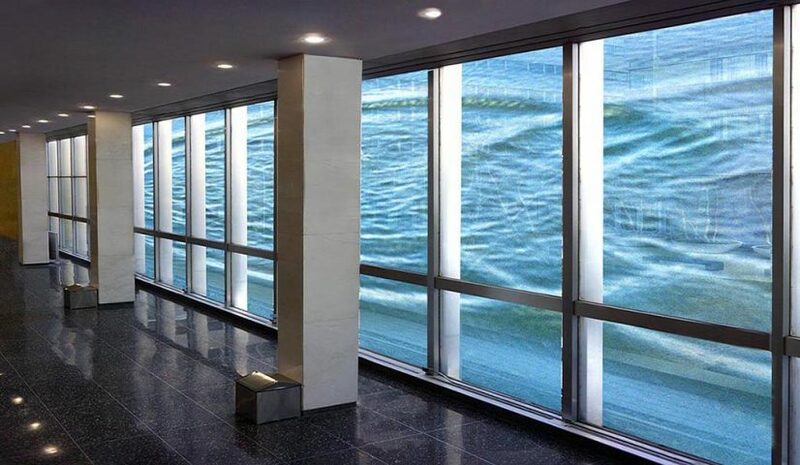 I envision my site-specific installation piece as the transformation of the glass wall into a participatory space of rest, meditation and healing: an organic presence amid the everyday activities of public life that take place in the building. Double Life is a public-art work infused of the ever-changing light of the day and visible from inside and outside the hall: not an addition to the existing space, but a transformative experience that belongs physically and symbolically to the very place where the installation has been conceived. I believe that art should be experienced where life takes us, where we happen to be because of the circumstances, choices and occurrences of our daily wanderings. Doctors and patients, staff and researchers will encounter Double Life while attending the building for personal or professional reasons. In the Alumni Hall the artwork and the place, the imagery and the architecture are one: a special environment where each person can find his/her resonance; the generative energy of my work is offered to experience a personal time of rest and insight in its presence.